Diabetes Mellitus (DM 2) is a worldwide epidemic which is on the rise without much cure and associated with a number of short and long term complications resulting in devastating late complications and reduced life expectancy.Retinopathy is a major cause of morbidity in patients with diabetes mellitus. The incidence of blindness, for example, is 25 times higher in patients with diabetes than in the general population. If all complications of DM were combined, individuals with intensive diabetes management would experience 15.3 more years of life without significant microvascular or neurologic complications of DM, compared to individuals who received standard therapy. This translates into an additional 5.1 years of life expectancy for individuals in the intensive diabetes management group. Eighty percent of patients with DM 2 are obese or overweight, and weight reduction is one of the most efficient ways to achieve control of this illness. However, it is difficult to achieve a smooth normal blood sugar level readings with the conventional treatment like diet, exercise, oral tablets and insulin.On the other hand, impressive improvement in diabetic status of patients undergoing bariatric and metabolic surgery has stimulated interest in surgery as a potential cure for type 2 diabetes. Research shows there are intestinal hormones that have a striking effect on pancreas and insulin secretion, especially in response to food intake. On the basis of this, Brazilian surgeon, Dr Aureo de Paula, devised a laparoscopic operation that is proving very helpful in controlling diabetes, and avoiding future diabetic complications. A long segment of ilium (ending portion of small intestine) if shifted to the upper small intestinal area, where food particlesreaching immediately after the meal can cause an immediate secretion of a hormone, GLP-1, which acts on the B-Cells of pancreas to secret Insulin, to immediately control blood sugar. If there is no intake of food, this will not happen, so there is no danger of low blood sugar(hypoglycemia). It was originally thought that the control of diabetes was secondary to the resultant weight loss; however more recently, it has been noted that insulin impairment is reversed merely days after a metabolic procedure and therefore could not be solely to the weight loss. Dr. Aureo de Paula has been performing these surgeries for the last 7 years and has presented his work internationally, showing excellent results. He alone has performed over 700 such surgeries in the last seven years with utmost safety and excellent results of 95% remissions. His results have been published in number of articles in internationally reputed Journals like Surgical Endoscopy. He has been invited to various conferences throughout the world especially to Europe to present his successful path breaking work in surgical treatment of Type-2 diabetes. Besides Dr. Aureo de Paula, ten other surgeons in Brazil have also been performing these kind of surgeries. In all together since Dr. Aureo Ludoviceo de Paula pioneered Ileal Transposition surgery, 2000 patients have been operated upon. These surgeries are now being actively carried out in Mumbai by Dr Abhay Agrawal and his team and has done many suchcases so far. The operation takes around four hrs.The patient can start walking the next day of the operation and can begin work in a week. India being the Diabetic Capital of the world, this procedure should be able to do a lot of good for Indian diabetics. By the year 2025, India will be home to more than 80 million diabetics and most of these will be Type-2 Diabetics. This operation is an ideal operation for surgical cure of diabetes in non-morbidly obese patients also, as there is no malabsorptive element leading to the weight loss.They can stop all medicines within few months, at times even two to four weeks after the surgery. Good improvements are seen in their Triglycerides, cholesterol, kidney function and leg pains thus proving this to be a true metabolic surgery. Since there is no loss of intestinal length and no diversion of food, there are no long-term side-effects, no nutritional deficiency. The only changes in life is that, they have to consume smaller quantity of food at one time, but can live a disease free, longer and healthier life. In Type 2 diabetic patients with normal BMI, conventional bariatric surgery would be inappropriate, as it would lead to significant undesirable weight loss. In such patients ileal transposition is the future. Laparoscopic sleeve gastrectomy(LSG), a restrictive bariatric operation is added to Ileal transposition to induce weight loss in moderately obese diabetic patients. Diabetes resolved in all the diabetic patients, hypertension resolved in 92.9% and improved in the remaining patients. Despite the significant link between obesity and Type 2 Diabetes, 20% of patients with Type 2 Diabetes are not obese and some of these patients are unable to achieve adequate control of their blood glucose despite dietary and pharmacological treatment. In these non-obese patients, DM 2 is still associated with significant morbidity such as blindness, renal insufficiency, neuropathies, amputations, and cardiovascular disease and reduced life expectancy. While a significant body of research exists showing that bariatric surgery can reverse Type 2 Diabetes in obese individuals, there is limited but promising evidence of its efficacy in the non-morbidlyobese population. 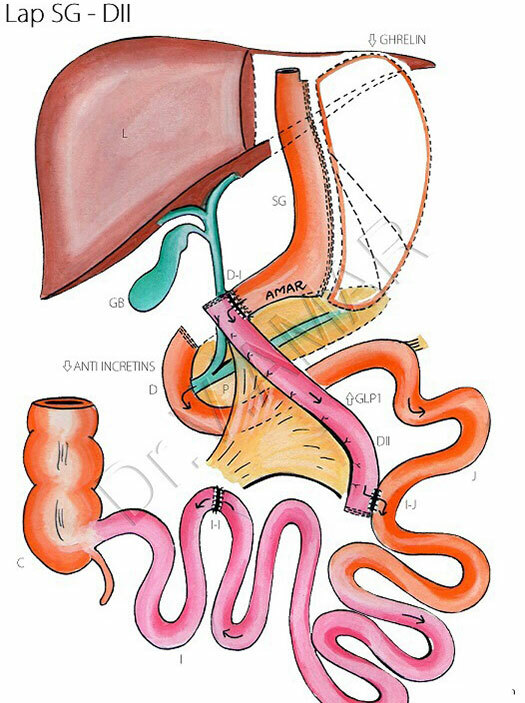 There is a role of ileal transposition for treatment of DM 2 in non-morbidlyobese patients. A study conducted in Brazil enrolled patients with BMI between 22 and 34 (mean BMI 26.6) and who had diagnosed Type 2 diabetes with inappropriate blood glucose control despite dietetic, oral drugs and or insulin for at least 3 years. The mean duration of DM 2 was 6.8 years. Patients underwent ileal interposition. There were no complications and 92.9% of patients achieved adequate glycemic control with a mean follow-up time of 9.2 months. This procedure could resolve DM 2 for patients who are facing serious life threatening complications. 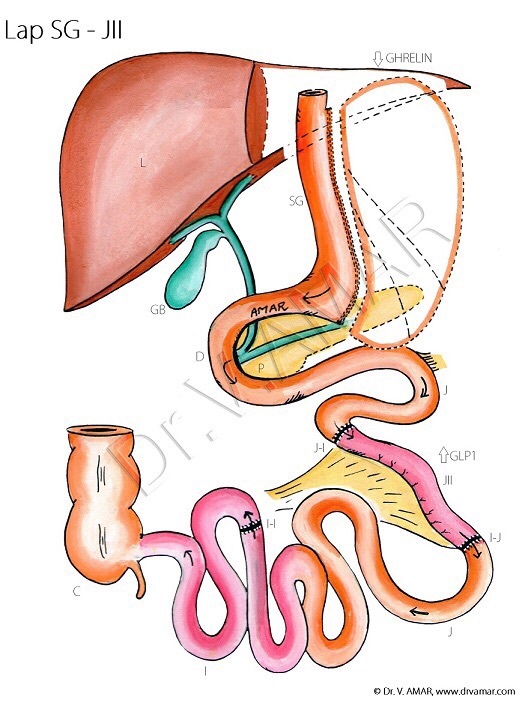 This metabolic surgery ie, ileal transposition with sleeve gastrectomy is effective even in non-morbidly obese patients with poorly controlled Type 2 Diabetes Mellitus. This procedure can be done for persons who have Type 2 Diabetes, who are on oral drugs & or insulin. This procedure will be useful if the C-Peptide blood test is more than one. The HBA1c test gives a person an indication of poor control if level is more than eight. Complications of diabetes will be arrested unless the organ damage has already progressed to a point of no return. So, this surgery can completely control diabetes, arrest the metabolic syndrome of body organ deterioration, thus avoiding future diabetic complications. High blood pressure and high cholesterol /triglycerides are also completely controlled or greatly improved and body loses excess weight which is good for overall longevity with good health. This switch operation causes a surge in the body’s insulin soon after taking food thus controlling post-prandial sugar. It also increases the insulin sensitivity of target cells so that fasting sugar levels dependent on liver are better controlled. Thus this operation controls sugar in the most physiological way by enhancing the effect of body insulin. The progressive destruction of insulin-secreting B-cells in pancreas is arrested. This is a surgery done on the intestinal tract, and not on the pancreas. The procedure is done by key-hole surgery; is practically blood-less; using modern state-of-the-art Stapling Devices and blood vessel self-sealing devices; needs about five days of stay in the hospital for observation, especially of the dropping blood sugar levels. The higher cost of this surgery is because of all the advanced equipment and skills required. It is hoped that in future this treatment gets included in the Chief Minister’s medical scheme for the poor people. Diabetes being a medical disease, it was traditionally treated by diet and exercise with mild oral medicines. When this progressed, more drugs were added to control blood sugars; when this went on increasing, insulin injections were added. Diabetes is the cause of cardiac problems and kidney failure in many patients; it is a killer disease with epidemic proportions, in Asia, especially in India. The disease keeps on progressing in most people with on-going complications on many organs in the body. It is associated with high cholesterol levels, high blood pressure, fatty liver disease, obesity and polycystic ovary disease causing the Metabolic Syndrome. Thus, the greatest interest in the Laparoscopic Surgical field right now is Metabolic Surgery, especially for control of Diabetes, and Hyderabad being the ‘Diabetic Capital of India’ as many physicians put it, and India being the Diabetic Capital of the world, this procedure should be able to do a lot of good for Indian diabetics. Type 2 diabetes can be a lifelong condition. Type 2 diabetes is an increasingly widespread health issue in India and has serious long-term consequences. You may want to compare bariatric surgery’s high resolution rates for type 2 diabetes to the long-term effects of the condition. Eye complications such as glaucoma, cataracts, and nerve damage, which can lead to blindness.